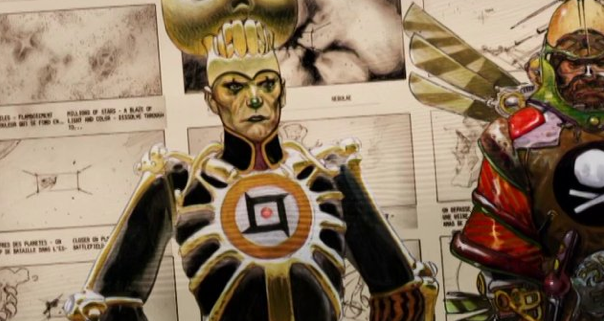 Jodorowsky's Dune - The Greatest Epic Movie NEVER Made! I was spending the afternoon with my oldest son to belatedly celebrate his birthday. It started with lunch and a catch up chat at the Italian Kitchen in Vancouver, followed by shopping to pick out a few gifts. Just in case, I had thrown out the name of a movie we could go to if things went quickly - Jodorowky's Dune. How did I pick it? I looked at the local theatre listings and it was the only one that sounded interesting. Dune is a truly iconic, epic science fiction book written by Frank Herbert in 1965. A film version was released in 1984 that, although IMDb gives it three and a half stars, was considered a failure by science fiction fans. 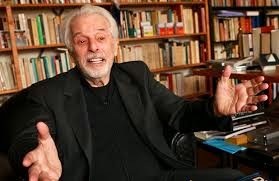 So who was Alejandro Jodorowsky? A quick look at Rotten Tomatoes offered up this synopsis as - In 1975, Chilean director Alejandro Jodorowsky, whose films EL TOPO and THE HOLY MOUNTAIN launched and ultimately defined the midnight movie phenomenon, began work on his most ambitious project yet. Starring his own 12 year old son Brontis alongside Orson Welles, Mick Jagger, David Carradine and Salvador Dali, featuring music by Pink Floyd and art by some of the most provocative talents of the era, including HR Giger and Jean 'Moebius' Giraud, Jodorowsky's adaptation of Frank Herbert's classic sci-fi novel DUNE was poised to change cinema forever. - as well as ratings of 98% for critics and 88% for audience. I was intrigued. While we were both worried a documentary would be boring, especially at the start when it featured a subtitled interview with Jodorowsky, I was drawn in to the story from start to finish. When the avant garde film maker was asked by a backer what he would like to do next - he emphatically replied DUNE. This was an immense project conceived pre-Star Wars and was to include effects that even George Lucas didn't consider possible at the time he filmed his movie in 1977. It was interesting to note he had not read the book at the time - only knew what a friend had told him. This theme carried on throughout the project as those he brought on board listened and worked with the vision he related to them. --Moebius (Jean Giraud), a French comic book artist who sketched 3,000 drawings illuminating every single scene, costume and camera angle. "I wanted to carry out film on paper before filming it... These days all films with special effect are done as that, but at the time this technique was not used. I wanted a draughtsman of comic strips who has the genius and the speed, who can be used as me as a camera and who gives at the same time a visual style... Giraud made 3000 drawings, all marvellous... The script of Dune, thanks to his talent, is a masterpiece. One can see living the characters, one follows the movements of camera. One visualizes cutting, the decorations, the costumes." --British sci-fi artist Chris Foss who illustrated the covers of sci fi books was chosen to create the spacecrafts. 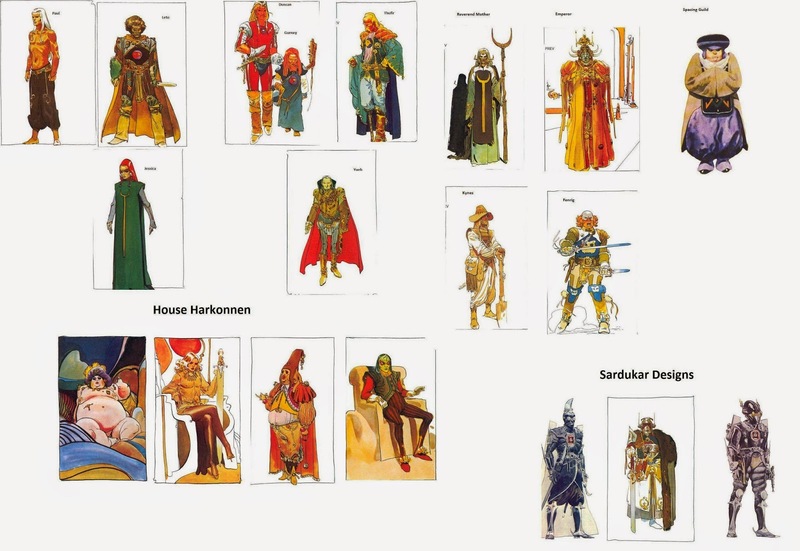 "This artist, with the ships which he produced for Dune, marked the cinema. He could produce semi-alive machines which could be metamorphosed with the color of the stones of space... He could produce "thirsty battleships dying century after century in a star desert awaiting the alive body which will fill their empty tanks of subtle secretions of its heart..." Jodorowsky's vision? --Swiss surrealist H.R. Giger was next. Jodorowsky was drawn to the very dark nature of his art and gave him the assignment of creating the look of one specific planet. "His art declining, sick, suicidal, brilliant, was perfect to carry out the Harkonnen planet... He made a project of castle and planet which really touched with the metaphysical horror." When this project folded he went on to be an intricate part of the film 'Alien.'" --Dan O'Bannon was one of those brilliant twists of fate. Jodorowsky went to LA originally to meet with Douglas Trumbull who was considered the top of the special effects industry at the time. His vanity and arrogance sounded a death knoll to any collaboration. "Tired of all this comedy, I left to research a young talent...I saw in a modest festival of cinema by science fiction amateurs, a film made without means that I found marvellous: Dark Star. I contacted the boy who had made the special effects: Dan O' Bannon. I was almost with a wolf child. Completely out of conventional reality, O'Bannon was for me a real genius...I was not mistaken: Dan O'Bannon wrote later the scenario of Alien and a good number of other films with great success." With the core team in place, the project began to take shape. Jodorowsky filled out the cast with unusual choices - David Carradine as Duke Leto, Salvidore Dali as the mad emperor of the galaxy (had to offer him $100,000 per hour), Mick Jagger, Orson Welles (he had to bribe him with food from a specific chef) and his own son Brontis, who was to play Paul. Brontis was only 9 at the time and was put through 2 full years of rigorous combat training in the knife, karate and archery with legendary bodyguard Jean-Pierre Vigneau. For music he chose Pink Floyd and Magma. Over two years the team created a storyboard book that included prints of all the costumes, space craft, planets and buildings as well as sketches of every camera angle and every scene to be shot - it was the size of a large phone book. 10 copies were made and sent to every major Hollywood studio. While the planning and vision was applauded by everyone, and they had already raised about 2/3 of the cost, not a single studio picked it up. The studios were afraid of this very artsy film maker. The film looked to be immensely long - one estimate put it at 14 hours. Today it would be embraced and split into an opening movie with several sequels if successful, but back then it just wasn't done. As one person interviewed in the documentary put it, "He was literally ahead of the time. He was trying to make his big-budget science-fiction space opera at a time when Hollywood didn't understand that. Didn't understand that that was marketable, that was a smart idea financially. This is pre-Star Wars, pre-science fiction revolution. So I think he was literally generations ahead of the audiences and the people with the money." While this film was never made, the work was not a total loss. Jodorowsky and Moebius took some of the work and turned it into a successful series of comics call The Incal. His team of unknowns went on to have a huge influence in the world of science fiction movies starting with Alien. Shadows of images from the storyboard can be seen echoed throughout many major motion pictures. The movie version of Dune that was released never came close to the scope and vision of Jodorowsky's, only a Hollywood offering without depth. Sad that this brilliant, unique version didn't get the opportunity bring something totally new and cutting edge to the audience. "Almost all the battles were won, but the war was lost. The project was sabotaged in Hollywood. It was French and not American. Its message was not "enough Hollywood". There were intrigues, plundering. The story-board circulated among all the large studios. Later, the visual aspect of Star Wars resembled our style. To make Alien, they invited Moebius, Foss, Giger, O'Bannon, etc. The project announced to American the possibility of carrying out science fiction films to large spectacle and out of the scientific rigour of 2001: A Space Odyssey. The Dune project changed our life. When it was over, O'Bannon entered a psychiatric hospital. Afterwards, he returned to the fight with rage and wrote twelve scripts which were refused. The thirteenth one was Alien. Like him, all those who took part in the rise and fall of the Dune project learned how to fall one and one thousand times with savage obstinacy until learning how to stand."